Water purification plays a key role in ensuring access to safe drinking water. Safe drinking water positively impacts the health of the entire community. Systems are in place to ensure ongoing water quality, including water quality testing. The testing helps ensure the water treatment process results in a product that meets federal water quality guidelines. Water analysis involves looking for several kinds of contaminants, including unsafe levels of organic, inorganic, microbial and/or radioactive contaminants. Water from lakes, rivers or the ground passes through a screen as it enters the water treatment plant. When the water source is a lake or river, the screen serves an important function, keeping out large natural contaminants such as plants and wood, or fish. If ground water is used, screening may not be necessary since the water has passed through layers of the earth in what is essentially a natural screening function. Treatment plant workers add alum and other chemicals to the water, which cause tiny sticky particles, or floc, to form. These floc attract dirt particles, making them eventually heavy enough to sink to the bottom of the water storage tank. The water and floc flow into a sedimentation basin. As the water sits there, the heavy floc settle to the bottom, where they remain until removal. Water passes through layers of gravel, sand and perhaps charcoal, which serve to filter out any remaining particles. The gravel layer is often about 1 foot deep and the sand layer about 2½ feet deep. Water goes into a closed tank or reservoir. Chlorine or other disinfecting chemicals kill any remaining microorganisms or bacteria in the water and help keep the water clean until distribution. 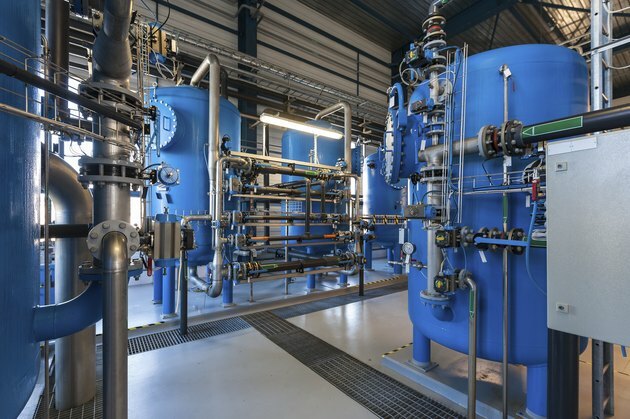 If a water treatment facility uses ground water as its only water source, disinfection may be the only step required to sufficiently treat the water. After it is disinfected, the purified water sits in the closed tank or reservoir until it flows through pipes to homes and businesses. Duke University: How is Water Purified? World Health Organization: How Does Safe Water Impact Global Health?